Check back later or contact us now. Fancy Hunter for sale. Registered Hanoverian mare by Bon Balou out of a Autocrat mare. Baby Blush is a 15.3h, coming 4yr old. This mare has the 'wow' factor. Going well under saddle and just started over jumps. 2003, 16.2h, American Warmblood. Felix is a horse of a lifetime. Jumper, Equitation or Hunters this guy will do it all. Numerous championships. Felix is ready to take his next green rider through the ranks. Low five figures . Epiphany is a 3yr old, WB mare from Wensleydale Farms. Will make a lovely hunter/equitation horse. Cece is a purebred 2010 Holsteiner mare out of Speakeasy by Coppola. At 16.0h, this mare is light on her feet and compact. Very balanced gaits and ready to get some experience in the show ring. Has easily free jumped up to 3'9. Great Jumper/Equitation prospect. Easy to handle on the ground. Asking $15,000 price will in crease with training. Ginger is a 2007, 15.2 hand, registered Palomino/Tobiano mare. She has been trained in reining and has done lots of 4H. Recently she has been started over jumps and LOVES it. She would make a fantastic beginners horse and a great OHSET horse. 16.2h, 10yr old TB Gelding. We have had Granite in our barn for just about a week now and he is so gentle and kind. This guy will make a FANTASTIC Pre-Children's/Adult - Children's/Adult Hunter. Safe, Safe, Safe. I have not met a quieter TB. He has experience in the Children's hunters at rated shows and most recently dressage training. Asking $15k - good home is a MUST!! Hunter/Equitation Prospect - Meet Tex, 7yr old, 16.3 h, registered Appaloosa gelding. Tex has just been started over fences. This guy has the perfect rhythm for the hunter ring. Safe and friendly, this will make someone a fantastic partner. Asking $12000, price will continue to increase with training. Sold, congratulations Warioto Farm in TN! Bubbles is a 15.3 7/8 Hanoverian mare foaled in 1999. Bubble is truly a horse for all three rings. This year she is Champion in the Small Junior Working Hunters as well as Reserve Champion in the .95 meter jumpers for Oregon and Washington. She has enough chrome that she will stand out in the Hunter ring and she is caddy enough to win in the jumper ring. Bare Necessities is a 5yr old, 16.0 (and growing) TB gelding. This gentle baby has been started over fences and has just learned his lead changes. This guys is quiet enough for up down lessons and has a lovely canter step to take you any direction. Owner is having a baby and sadly must sell. Sold - Congratulations Kate and Elizabeth! Chances Are - Chance is a 1998, 15.3 1/4, Dutch Warmblood Gelding. 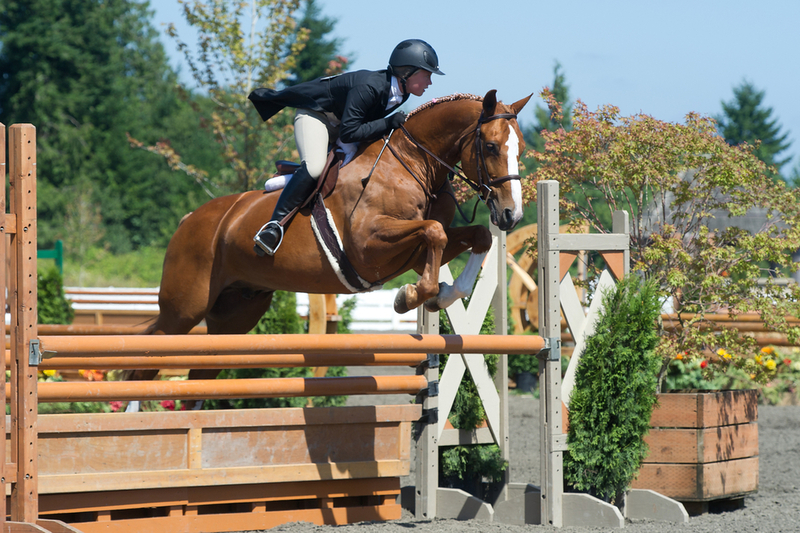 Chance has numerous wins in the Small Hunter, Children's Hunters, and Equitation Rings. His record speaks for his experience. Beau is a 17yr old, Thoroughbred gelding (16.3 hands). Beau has numerous years of experience in the Hunter and Equitation rings. He's calm and very sweet on the ground. Shakira is a 2003 16.1 1/4 hand Oldenburg mare by Cheenook. She has competed successfully up through the 1.10m with the prospect of going higher. Shakira is athletic, always willing, and has a great work ethic. She has won open jumper classes across the west coast including HITS Thermal, Oregon High Desert Classic, and others. Would make a lovely Childrens/Adult Amateur jumper. She's also a proven broodmare with several babies on the ground. Priced at 45k. Zanzibar - Jake is a 1997, 16.1h, TB gelding. They don't come much kinder than this guy. A solid long/short - pre-adult/children's hunter, Jake can teach the youngest of kids to the oldest of adults. Sold - Congratulations to Rob and Alice! Sir Boudewijn - Boude is a 16.0 hand 2005, Dutch Warmblood Gelding. Boude was OHJA Year End Champion in the Baby Green Hunters, Long Stirrup Hunters and Long Stirrup Equitation. Flashy enough for the Hunter Ring and Bold enough for the Event Circuit. This horse can do it all.